A black and white portrait photograph of Gunner John George Sutherland. This is a newspaper clipping from the Times-Gazette. 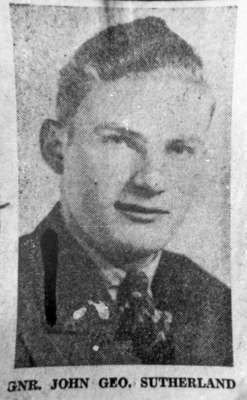 John George Sutherland was born on January 1, 1924, son of Kenneth and Isabella Sutherland, of Troy, Ontario. He came to Whitby in 1927. He enlisted in 1942 and arrived overseas in May 1943. A gunner in the Royal Canadian Artillery, he died of a cerebral hemorrhage in France on September 21, 1944. According to the Canadian Virtual War Memorial site he is commemorated at page 456 of the Second World War Book of Remembrance. He was a member of 5 Anti-Tank Unit and is interred at ADEGEM CANADIAN WAR CEMETERY, Belgium .